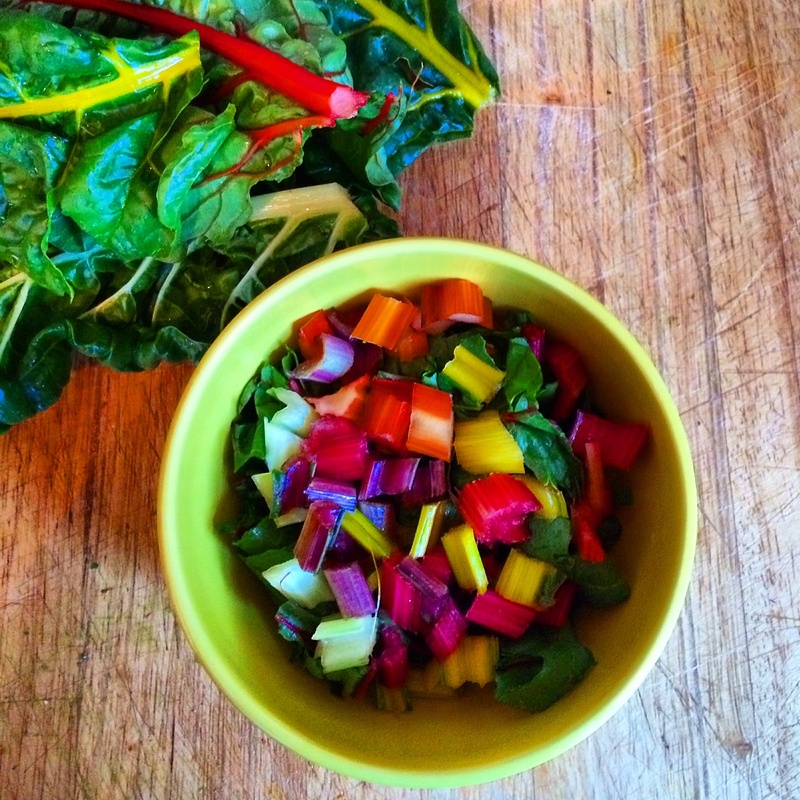 We have an abundance of beautiful rainbow chard growing in the ELE kitchen garden at the moment. The rich dark green leaves are easily grown and are an excellent source of vitamins and nutrients. We use the chard at all stages of maturity – the beautiful baby leaves for salads, the pretty candy colored stalks for pasta and risotto dishes and the mature leaves for soups and side dishes. For a very simple dish chop the pretty stalks and sautee in olive oil, garlic and lemon and toss through pasta, finished with shaved parmesan cheese. For a twist on traditional pesto, blanch the chard’s green leaves, squeeze out the excess moisture and in a pestle and mortar (or food processor) grind with parmesan cheese, garlic, olive oil, pine nuts and a handful of flat leaf parsley. We also love the leaves slightly wilted, tossed through butter and fresh thyme and served as an accompaniment to roast chicken or beef. Enjoy! What gorgeous colour! We are planting Peppermint Chard this year if the snow ever melts. They have red and white striped stalks, so lovely. Enjoy your salad! They sound great- we will have to look out for that variety here to plant next season! So colorful, but I always find chard so hard, any suggestions on the best way to enjoy it whilst being soft at the same time? Yeah? Thanks Anthony, I sure will! Hi Style-Lee, we pick the very young chard for salads and they are lovely and crisp but not too hard. With the more mature leaves and stalks the best option is to use in soup or sauteed in butter or lightly blanched as a side dish. Alternatively if you finely slice the stems and saute them with onion as a base for risotto they will become lovely and soft, and the leaves can be added to the risotto at the end so that they lightly wilt but remain lovely and green. For a great, healthy option try cooking the chopped chard in olive oil and garlic, stir through chick peas and add a cup of chicken stock and fresh lemon juice and reduce down until the chard is tender. Season and serve topped with feta and a chopped parsley. Enjoy! Sounds so delicious just reading it..lol. Thank you so much, this is helpful info! This is amazing! I grow hydroponicly and cant wait to try rainbow chard….anyone try this in hydroponics? I like that! Colorfull and simple!! Thanks!